The Yorkshire Terrier or Yorkie is a small breed of terrier dog. It originated in the United Kingdom in the town of Yorkshire, from where it gets its name. They were first bred to catch mice and rats, so they are often fast and energetic. 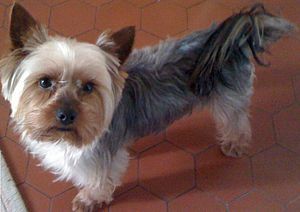 Yorkies usually weigh about 7 pounds (3.18 kg) and have a dark gray or black coat with a brown face. According to the American Kennel Club (AKC), Yorkies are the second most popular dog breed in America, behind only the Labrador Retriever. They are really playfull, they will always want to play.